Sketch C Showing the Progress of the Survey in Section III From 1843 to 1871. 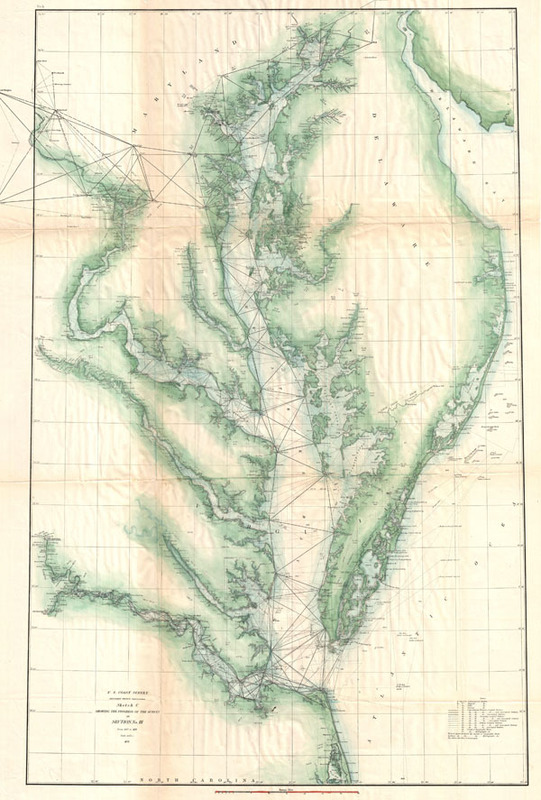 An exceptional example of the 1871 United States Costal Survey's progress chart of The Chesapeake Bay and Delaware Bay region. Covers from the mouth of the Susquehanna to Back Bay North Carolina, west as far as Washington D.C. and Richmond, and east as far as Cape May. Includes the Potomac River, Rappahannock River, York River, James River, Patapsco River, and Patuxent River. Identifies Washington D.C, Cape May, Charleston, Baltimore, Annapolis, Chestertown, Easton, Cambridge, Norfolk, and Richmond. Shows triangulation points throughout the Bay as well as all major Island Rivers and inlets. Lighthouses, ports, cities, beaches, and industrial sites noted. Prepared under the supervision of Benjamin Peirce for the 1871 Superintendent's Report. Report of the Superintendent of the United States Coast Survey, Washington, (1871 edition). Good. Some wear, verso repair and reinforcement, and toning along original fold lines.